"Walk the RAD Craft and Artisan Market is a unique urban shopping experience in the Riverside Arts District located inside various art venues along the 2800 and 2900 block of Race Street in the Riverside Arts District of Fort Worth. With an emphasis on all things handmade, our vendors showcase locally-made crafts, gifts, jewelry, ornaments, art, baked goods and so much more! So come out, enjoy the scene, and Walk the RAD!" "Last chance to purchase beautiful handmade gifts before Christmas. 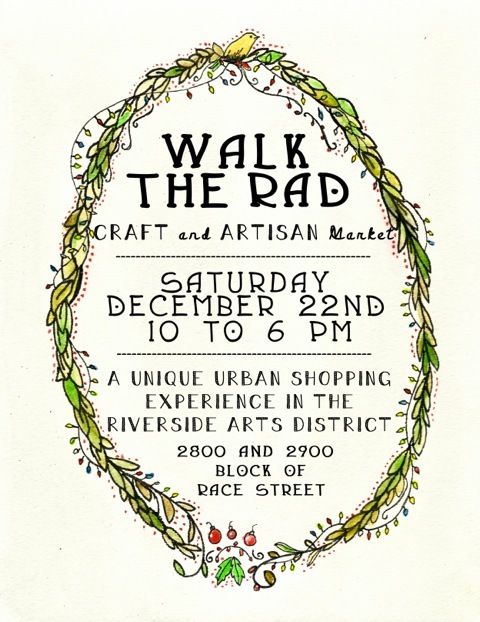 Join us December 21 through December 23, 2012 for a special weekend full of all handmade artists and designers. Live music and complimentary wine and beer."